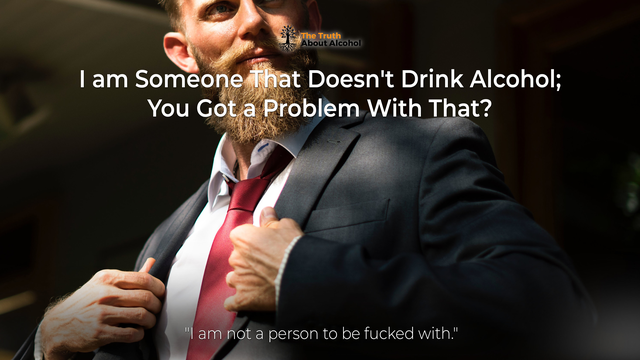 I am Someone That Doesn't Drink Alcohol; You Got a Problem With That? When I was a kid, I was the jumper in your closet that you never wore. I wasn’t good enough; I looked different, I was different. I could feel it in my marrow; the dogs would bark at me; people would throw sticks and stones at me. His name was Daniel, and my blow knocked him on his arse. I was on him like a whiskey on ice. He cried, told me to leave him alone. I got to my feet and reached out a hand. He grabbed it, blood pouring from his bugle like nose. I burst into tears and ran all the way home past the barking dogs, only this time they were laughing at me. That was the last time I cried due to physical pain. No punch ever hurt after that, and there have been a lot. I would never teach my children to punch first and ask questions later, but my Dad taught me a lesson that runs much deeper than flattening pimpled skin with my fist. You have to stand up straight with your shoulders back. I sat up straight with my shoulders back. I felt bigger, stronger, and more energised. When I stood up to my bullies instead of shirking away from them my bullies shirked from me. When we become people that don’t drink alcohol the bullies come out in force. It’s the only way they know to keep the cognitive dissonance at bay. When you tell people that you’re someone that doesn’t drink alcohol, and they ridicule you, in the slightest way, aggressive, passive-aggressive, I don’t care - they are bullying you. The best way to stiffen your back is to evoke a sense of pride. Be proud of who you are and the monumental change you have made. Let that pride ooze out of you. Spread that energy. If you act like this. Then the bullies will move onto someone else. That’s how you deal with coming out, and that’s what we talk about on today’s podcast.